Megasonic Sound is an Oakland, CA production facility. We have deep roots in the SF Bay Area music community and work on projects globally. Megasonic was designed by TEC Award winning Pelonis Acoustics. 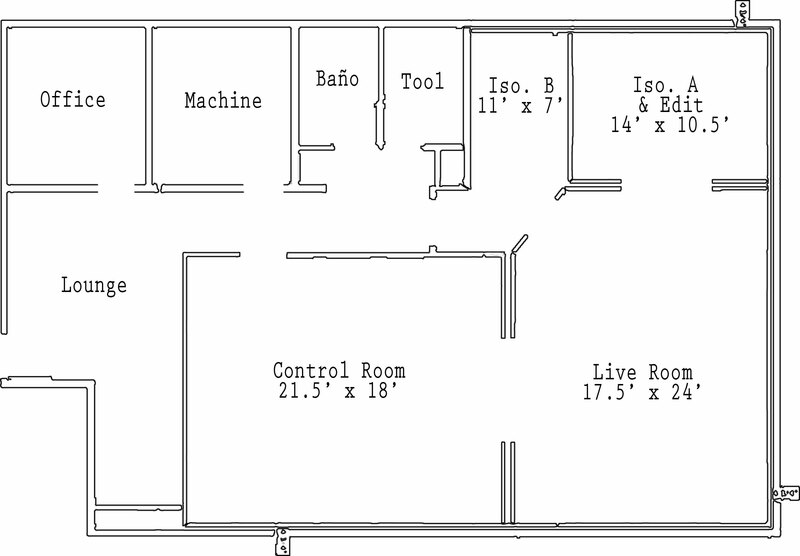 Comprised of the Control Room, three performance rooms and a hallway/lounge with additional connections. The Control Room is designed to provide a neutral atmosphere for relaxed tracking sessions, extended production work and detailed mastering sessions. The three differently-sized recording rooms allow for a variety of tonal and logistical options. The layout of the rooms offers good visual communication along with complete isolation of individual instruments. The Largest room has a clarity of tone and wonderful presence. It is large enough to fit a group of people to record without headphones. Iso A has a dry tone. It is large enough for a drum kit with plenty of room to breath. Iso A also doubles as an additional control room when needed. Iso B has a longer reverb time. It is good for an amplifier or soloist with plenty of room to move around. The hallway has the longest reverb time and is great for a variety of tasks. It has a lively, fun character and is well-suited for solo performers and sound design. Custom RPG acoustical treatment throughout the rooms ensures a balanced production environment.